I’m contemplating the empty pizza box that sits upon my desk. First I see dinner. Then I see a disposable by-product of an unsustainable consumerist culture. Then I see art. The artwork of Zeke Moores has raised questions about the fleeting engagement we have with objects, the dynamics of Fordism and the inherent connection between art and commerce. His choices of subject matter are the objects that define our daily lives. Moores spends countless weeks recreating familiar objects, casting them in expensive metals with skilful craftsmanship; he performs a cultural transformation that will convince you to never look at a dumpster the same way again. He does this to bridge the gap between art and everyday life, democratizing art for the gutter punk begging beside a trashcan, to the middle-class accountant who steps over him to dispose of his daughter’s happy meal. Moores’ dumpster made of cast bronze asks us to consider how we measure and assign a value to aesthetic beauty, forcing us to contemplate the “hierarchical systems of value that exist within the objects that surround us.” Historically, bronze was used in the fabrication of public monuments that memorialize and honour an important figure or event. So by recasting mundane objects into bronze, he removes their utility and creates a superficial esteem that elevates a simple alleyway dumpster to the stature of Rodin’s The Thinker. Many people confuse a representation of reality with reality itself, not realizing that an object’s meaning is inherently affected by the material it is made from. Philosopher Alfred Korzybski once wrote, “The map is not the territory,” thus implying an abstraction imitative or reactive to something, is not the thing in itself. 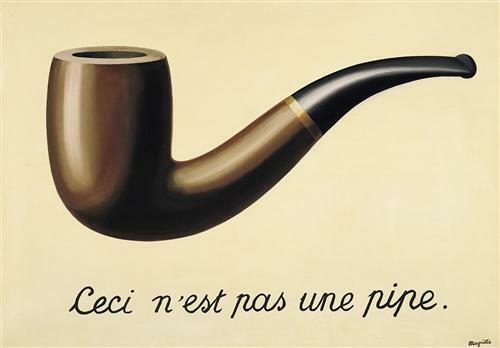 In The Treachery of Images René Magritte, declares his painting is not the object, just as a Moores’ cast aluminum port-a-potty is more of a platonic form than it is a place to squat in a gut-clenching Mexican burrito aftermath. Despite what you think, your Facebook profile is not you. Your Facebook profile rather, is a highly edited abstraction of your ideal self. In Robert Pirsig’s Lila, the main character becomes momentarily lost because of depending far too heavily on a map, rather than focusing on the territory it is describing. Whether defining ourselves by our career accomplishments or our family photo album, this is a philosophical pitfall we all succumb to. Ann Marie Barry writes that we must recognize “perception always intercedes between reality and ourselves,” only we can begin to lift the veil that blinds us. An artist looks at common objects from uncommon perspectives, examining them from every angle, viewing them as if he has never witnessed them before. Pure beauty can be found at the bottom of a garbage can, and you might find that the toilet you perch on each morning just might be the highest form of art.